The entire wine industry in Alsace is built around wines with up-front and easily recognizable grape character. Consequently, Alsace is the only region in France where you can put the grape on the label. 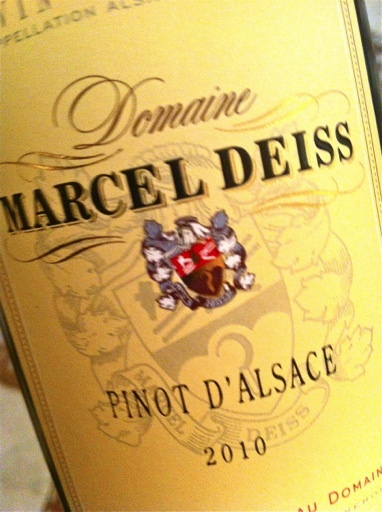 However, Marcel Deiss enhances stresses the terroir, and most of their wines are sold with only vineyard designation. Pinot d'Alsace is an exception, although it is impossible to be sure which grapes the wine is made from. My tip: Pinot Gris, Pinot Blanc and Pinot Noir in descending order. 2010 Pinot d'Alsace from Marcel Deiss Bergheim is deep yellow. The scent is very much "pinot", if you close your eyes reminiscent of a powerful Champagne with chocolate, lemon and distinct features of the storage sur lies fines . The taste is broad and complex with harmonious fruit salad character and sounding, solid acids and premiere balance. An extremely well crafted wine, sold Sweden for SEK159! Price: € 12.